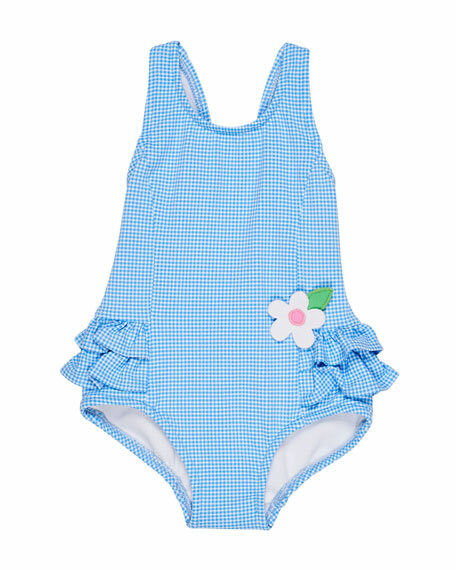 Florence Eiseman gingham one-piece swimsuit. Scoop neckline; low cut back. Wide straps. Tiered, ruffle trim at seat and sides. Flower appliqu at left hip. Full seat coverage. Nylon/spandex. Imported. Florence Eiseman two-piece swimsuit set in striped waffle knit, embellished with applied flowers. Tankini top with contrast straps and keyhole at back. Coordinating hipster bottoms. Nylon/spandex. Imported. Milly Minis solid two-piece swimsuit. Halter neckline ties at neck. Ruffle detail at top. 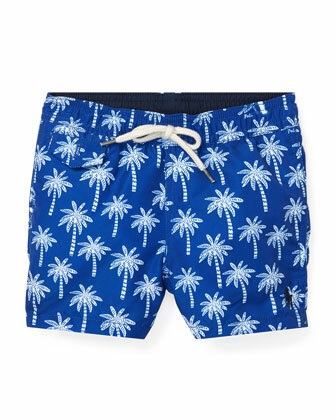 Bandini top; hipster bottoms. Full coverage bottoms. Nylon/spandex. Made in USA of imported material. Miniclasix one-piece swimsuit with ruffle trim through chest. Square neckline. Spaghetti straps. Tiered, tulle skirt with rosette trim. Full seat coverage. Main: nylon/spandex. Lining: polyester. Imported.